In the first season of the hit NBC show "The Apprentice" members of the winning team were rewarded with a cruise around the New York Harbor. Watch Team Versacorp spending the afternoon cruising and enjoyed lunch aboard The Caylpso. The Calypso was also the venue fro Ivanka Trump's bachelorette party! Calypso is a truly classic yacht. She is a styled aluminum hulled yacht with mahogany cabin sides and teak decks and can comfortably accomodate up to 34 passengers. 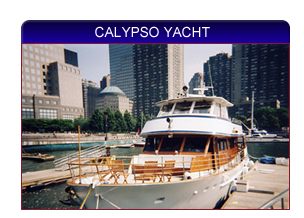 The Calypso was custom built by Stephens Yacht in 1973 for Mr. and Mrs. Jack Wrather of Hollywood CA. She was originally christened “The Lone Ranger” in recognition of the radio/ TV show created by Mr. Wrather. 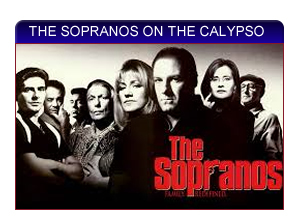 Cruising on Calypso is among Steve Schirripa's favorite activities while in NYC and often invites his fellow Sopranos cast members. Calypso has also been enjoyed by such guests as the Jonas Brothers, Neil Diamond, Catherine Zeta-Jones, Nick Cannon, and has been features on the Bravo network "Real Housewives of NYC" and "The Proposal Planner". Designed and built in 1967 by Bender Yachts for Mr. and Mrs. Tom Bender and originally christened El Toro. 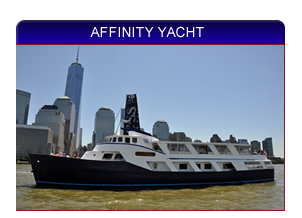 She was refurbished in 2007 and christened Affinity. She is perfect for larger parties and is Coast Gaurd Certified for 149 passengers.